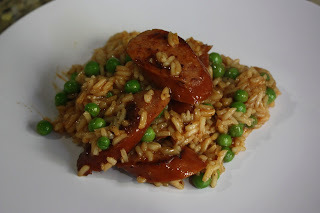 This dish is smoky, and comforting, not to mention super easy and quick to make and has no processed crap in it! 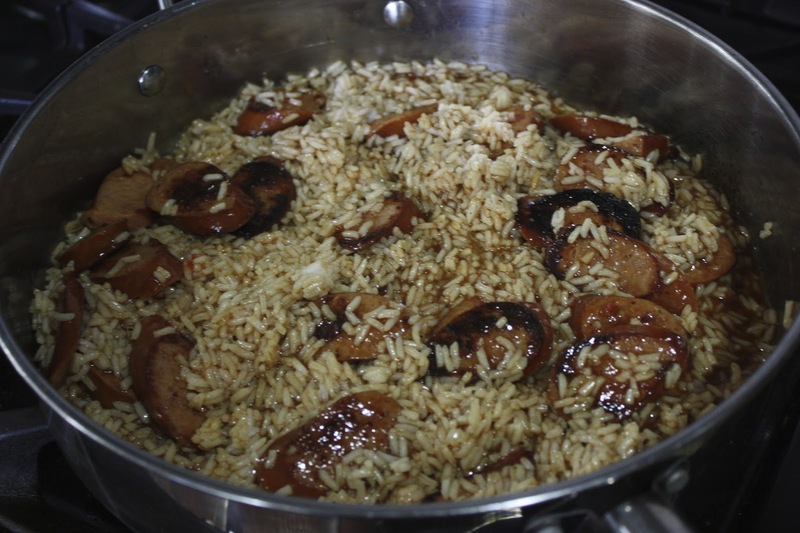 I use rice that has already been cooked for this recipe, some times when I make rice I will make double to use later in the week in other recipes. 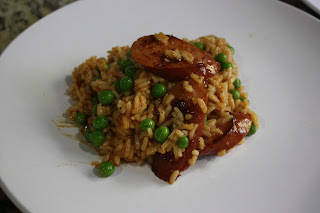 You can use brown or white rice in this recipe both would taste great, I used some leftover white rice this time, but I usually use brown rice because I like the texture it adds. I also use peas in this recipe because I LOVE peas and we eat them all the time. Other veggies that would be delicious would be broccoli, green beans or carrots, and frozen or fresh would be great. 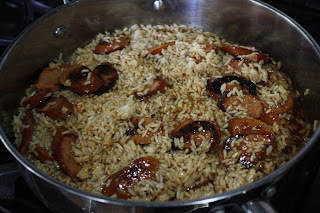 This recipe is a result of wanting to make my spicy sausage pasta (Recipe) and not having anything but sausage from the recipe on hand, and leftover rice. Its kind of like a jambalaya or dirty rice recipe. Cut sausage into slices on the bias. 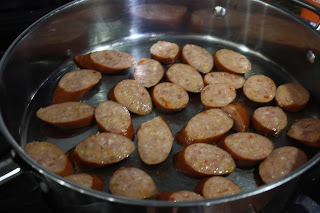 Sauté in a large skillet until lightly browned. Add onion and garlic to skillet and sauté over medium-high heat until tender. Stir cornstarch and chicken broth and add to skillet, scraping to loosen browned bits from bottom of the pan. 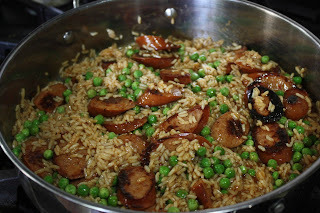 Add the spices, rice, and frozen peas. Bring to a boil. When sauce starts to thicken turn off the heat and put lid on for 5 minutes. My husband and I ate this in a bowl by itself but it would also be great with a salad. ENJOY!